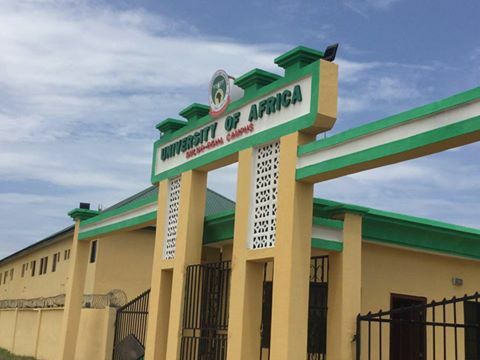 University of Africa, Toru-Orua, (UAT) Bayelsa State UTME Degree First Batch Admission List for the 2017/2018 Academic Session Released. The The University of Africa, Toru-Orua, (UAT) Bayelsa State wishes to inform all UTME applicants that the admission list for the 2017/2018 academic session has been released. UAT Beyelsa First Batch Admission list has been uploaded online. All successful candidates whose names appear on the list should immediately proceed to ACCEPT the offer of admission via UTME Portal and print out their admission letters and wait for resumption. Proceed to upload their O’ level results (if this has not yet been done) on UTME Portal in order to qualify for admission. If you fall within the ‘CATEGORY B’ above and though you have uploaded your O’Level but still can’t find your name on the admission list, Kindly check with the HELP DESK for further information and assistance at the University of Africa, Toru-Orua Liaison Office, Yenagoa, Bayelsa State. registrar@uat.edu.ng Congratulations to all Admitted Students!! !